In an effort to bridge the cultural divide between techies and fuzzies, Stanford Art Spaces (SAS) regularly mounts two-month exhibitions of contemporary art that are primarily situated in science and engineering buildings. The current show, which runs through April 26, features abstract paintings by Michael Fram of Oakland and Timothy Stroth of San Francisco, in a set of offerings that tweaks the familiar in distinctive ways. Fram’s “decorative ornamental compositions” range from pure abstractions with floating shapes and planes—some of them executed in brilliant Fauve color—to warm-toned fields dotted with recognizable imagery (starbursts, squiggles, birds, lightning bolts, comic-style figures) that are cheerfully carnivalesque in tone. His whimsical sense of humor comes across in some of his titles (“Cow Abstraction,” “Fun Color Composition,” “Smiling Composition” and a “Bric-a-Brac” series) as well as in his images. Stroth enlivens his hard-edged geometric abstractions with striking color combinations that contrast warm and cool colors to create a push-pull optical space, a kind of counterpane/quilt landscape for the roaming eye. His early checkerboard-format paintings took their grid-composition inspiration from carpets. Later works employ horizontal rectangles laid in courses like bricks, each containing an inset done in a contrasting color, suggesting framed pictures. In some works, these flat shapes are warped, suggesting billowing fabric; in others, the frames spiral outward from the center of the canvas, their undulant forms suggesting 1960s psychedelia. 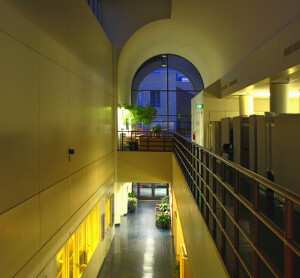 SAS has been sponsored by the Center for Integrated Systems, which is based in the Allen Engineering building, since 1985, when it was initiated by then-Professor of Electrical Engineering John Linvill. Current curator Priscilla Hexter said that she simply happened to be “in the right place at the right time” when she became the third SAS curator in November 2013. The program is unusual, offering the programming freedom of a commercial gallery with the community-building potential of a nonprofit—and, given the yellow-windowed, 10,500-square-foot nanotech clean room— populated by bunny-suited technicians— at its core, it is not exactly the white-cube gallery stereotype. Exhibits— held in the Allen Building, the adjacent Packard Electrical Engineering Building and other venues around campus— are free and open to the general public during weekday business hours.